New York - Less than a week after a controversial tweet denying the existence of Palestine, City Councilman Kalman Yeger has been removed from his seat on the council’s immigration committee. Yeger’s tweet resulted in a public outcry and The New York Times (https://nyti.ms/2YAs6W2) reported that he was removed from committee after a council leadership meeting that lasted over an hour. Participants said that Yeger’s remarks were incompatible with the committee’s mission. “I do not believe that someone who engages in the type of rhetoric we heard from Councilmember Yeger belongs on the immigration committee which is supposed to welcome and support immigrants in our city,” said Speaker Corey Johnson. As previously reported on VIN News (http://bit.ly/2YEvGhY), Mayor Bill de Blasio had said on Friday that Yeger should either apologize for his remarks or be removed from the committee. Yeger had categorically refused to rescind his statement, even as he found himself in the center of a sea of controversy and criticism, still sticking to his guns tonight, even after news of his removal broke. A jubilant tweet posted by Palestinian activist Linda Sarsour announcing Yeger’s removal from the committee received nearly 1,000 likes in just over an hour. “No longer will anti-Palestinian and anti-Muslim comments by an elected official go unchecked. It’s a new day,” tweeted Sarsour. 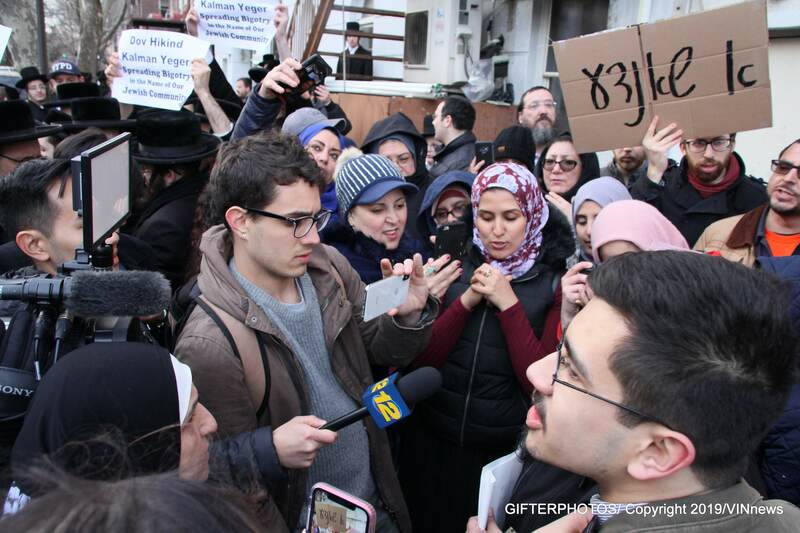 Those sentiments were echoed by former Assemblyman Dov Hikind who mobilized the Jewish community to rally against a protest in the heart of Borough Park denouncing Yeger. Hikind called today’s decision outrageous and shameful. Yeger is not the first city councilman to have a committee assignment retracted after making a remark that generated controversy. City Councilman Ruben Diaz Sr. found himself in trouble in February after making a statement that offended members of the homosexual community, with Yeger joining the overwhelming majority of the council voting to dissolve the For-Hire Vehicles committee which he chaired, as reported by NY1 (http://bit.ly/2TOkMT6). Diaz wasted no time speaking his mind on the latest development in the controversy, responding to a tweet posted by Yeger on the importance of free speech. “I do agree with kalman [sic] Yeger when he said ‘free speech must reign, even in the Council’ to [sic] bad he did not agree with me when they came after me and speaker [sic] Johnson eliminated my committee.” tweeted Diaz. Now will congress remove Omar from her committee? I doubt it. Liberals are FEH. Why would they ever have an immigration committee? A pothole committee I coudl see. SHAME ON THE NYC COUNCIL PRESIDENT !!!!!!!!!!!!!!!!!!!!!! Tea Party PAC) – Rep. Ilhan Omar (D-MN) seems determined to keep up her reputation as one of the most outrageous members of Congress, and she clearly thought she hadn’t been doing enough to keep her names in the headlines lately. The notoriously anti semitic freshman congresswoman is blaming “white nationalism” for a border crisis which is undoubtedly caused by the hundreds of thousands of migrants who freely choose to illegally breach our southern borders. Why? Because border facilities are so overwhelmed, migrants are being kept outdoors. So…the Dems think it’s racist when we don’t let people in…and racist when they get in anyway and we have to figure out what to do with them? “This is abhorrent and inhumane. It’s without a doubt a reflection of what white nationalism is doing to our country. As a country, we have to acknowledge that this is how people are being treated here and decide that we are better and we must do better,” she tweeted. Omar was responding to a photo posted by the Washington Post’s Nick Miroff. “ Tea Party PAC) – Rep. Ilhan Omar (D-MN) seems determined to keep up her reputation as one of the most outrageous members of Congress, and she clearly thought she hadn’t been doing enough to keep her names in the headlines lately.
" undoubtedly caused by the hundreds of thousands of migrants who freely choose to illegally breach our southern borders"
Wrong. The illegal breaches are caused by Trump ordering Customs and Border Protection to break the law by not accepting asylum applications. Asylum applicants are in the US legally. But Trump lawbreaking gets excused by his cult. "“Today I join in celebrating Yom Ha’atzmaut, Israel’s Independence Day. For 70 years the State of Israel has stood as a beacon of hope and opportunity, overcoming seemingly insurmountable challenges. I am honored to be in Israel to mark this historic occasion with my Council colleagues on a mission to learn more about Israeli culture and economic opportunities, as well as to meet with civic, government, and business leaders. As Americans we saw firsthand the shared democratic principles and values that both our countries possess. We have also seen and met many people hard at work with a genuine spirit of innovation and entrepreneurship, and a desire to provide a better life for themselves and their children. Clearly, the Israeli dream is no different than the American version, nurtured in an environment like ours that encourages free-thinking, free speech and a commitment to equality. I stand here proudly as an American with a genuine love for the people of the State of Israel, wishing their country a happy 70th. Am Yisrael Chai!”"
America is back to the time of 1930s with rampant anti semitism being heard all over- Dove Hikind and Yerger , come home to israel the only place for jews today. Good. Now he will be able to get back to doing that which he was elected to to. Namely, making sure the streets of his district are clean and that people have access to goverment programs. “ " undoubtedly caused by the hundreds of thousands of migrants who freely choose to illegally breach our southern borders"
You are sick and getting sicker. Just proving once again the "white male privelage" saying is a farce. If he was a woman of color he would have been able to keep his job. #Omar. go back to sleep, taatele !!! He shouldn’t stick his nose and rattle up people here in NYC, serve your constituents and bring something significant for the average person in the community. Because a large percentage of those living in NYC are immigrants. This is not Saudi Arabia. > Treatment of aliens arriving from contiguous territory.-In the case of an alien described in subparagraph (A) who is arriving on land (whether or not at a designated port of arrival) from a foreign territory contiguous to the United States, the Attorney General may return the alien to that territory pending a proceeding under section 240. Please move to Louisiana, Iowa and other Republican States where everyone loves Jews. Just ask Rubashkin. “ Because a large percentage of those living in NYC are immigrants. You really believe Pualin is from saudi arabia? I question your credibility let alone honesty after that comment. We (frumme yiddin) are embarrassing ourselves. We are being associated with all the nastiness of the twitter age. Of course Kalman is right, that doesn't mean we have to be in everyone's face all the time. Whatever happened to using some seichel. We are going to regret what we have become!!! If this doesn’t prove that the democRAT party has become completely anti semitic, what will! Yeager gets thrown off but the Muslim bigot gets to stay on the foreign affairs committee where policy towards Israel is decided! Any new who votes democrat ever again should be ashamed! !